When Chef Carl Casper (Jon Favreau) suddenly quits his job at a prominent Los Angeles restaurant after refusing to compromise his creative integrity for its controlling owner (Dustin Hoffman), he is left to figure out what's next. Finding himself in Miami, he teams up with his ex-wife (Sofia Vergara), his friend (John Leguizamo) and his son to launch a food truck. Taking to the road, Chef Carl goes back to his roots to reignite his passion for the kitchen -- and zest for life and love. 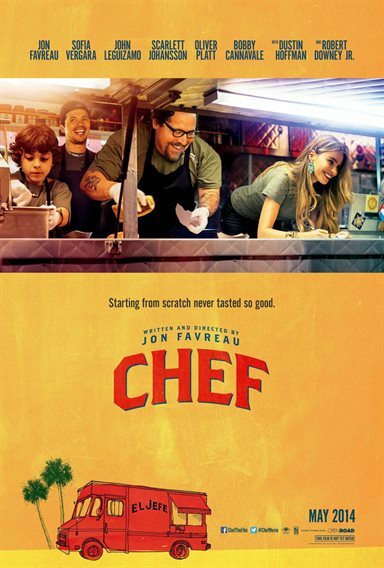 Download Chef in Digital HD from the iTunes store. Chef images are © Open Road Films. All Rights Reserved. Very funny and charming movie. One of the best movies of the year!